The Old Hunters is an expansion DLC for Bloodborne. It features all new Locations, Bosses, Weapons, and Armor. A FREE patch (Patch 1.07) has added new covenant The League as well as friendly Old Hunters NPC summons for everyone. Defeat Vicar Amelia and activate the skull in the Cathedral to turn day into night. Go to the Hunter’s Dream and receive Eye of a Blood-Drunk Hunter from a messenger. Go to the Cathedral Ward and leave via the left-hand exit to enter the square. Lighting the lamp in the new area will allow you to travel to and from the area via the Hunter's Nightmare Awakening Headstone in the Hunter’s Dream . It can be found by the Insight Shop, where the Doll will sometimes kneel and pray. Expansion Developer Interview! 10 New weapons confirmed! Q： What kind of content is included with the Bloodborne The Old Hunters expansion? A： The Old Hunters expansion depicts a nightmare world where the old hunters are captured. It includes new areas, weapons, mysteries, items, and costumes. Q： Can you play the Bloodborne The Old Hunters expansion without having the original Bloodborne game? A： No. 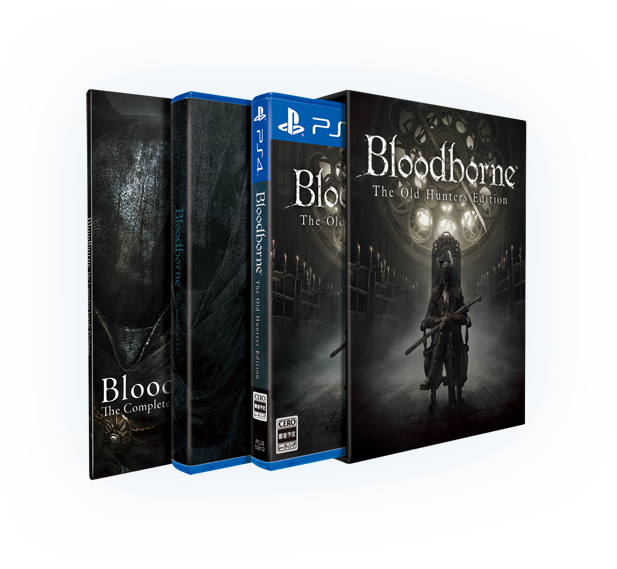 You will not be able to play without the original Bloodborne game. Q： Can users who have installed the expansion interact online with other players who have not? A： Just as it is now, all players will be able to interact online in the areas from the original game. Online interaction in the expansion's additional areas will only be possible among players who have the expansion installed. Q： How do you access the Bloodborne The Old Hunters expansion? Q：Can you use the save data from a cleared game of Bloodborne? A： Yes. Also, if you are replaying the game and progress to a certain point, you will be able to access the newly added areas in the expansion once you acquire the Eye of a Blood-drunk Hunter. Q： Will there be trophies added in the Bloodborne The Old Hunters expansion? A：Yes, trophies will be added. Q： Will you not be able to complete the story if you do not play the added content from the Bloodborne The Old Hunters expansion? A. You can still get to the ending(s) without playing the new content in the expansion. can i use my old char if i buy the dlc physical copy ??? I am playing with a physical copy of the base game, can i buy just the DLC from the store? I dont have to buy a digital copy of the game, do i? I&apos;ve defeated Gerhman but now I cannot reach the cathedral anymore. Do I have to play the game again untill I reach the cathedral to play the old hunters DLC or is there another way? the old hunters are insane. basical offline pvp all over the shop. What were they thinking? Who in the right mind fights those dudes instead of running away from them? Ma se io uccido Vicario Amelia per la prima volta accedo al Dlc? Hi, I have the original bloodborne disk (CUSA 00207 - Region Europe). If I buy the GOTY edition how can I replace my original save game in the GOTY edition? I already finished the game and now playing NG+. I have the goty edition and I didnt really pay attention how to enter the dlc so i skipped it. I have the eye in my inventory but I have already killed Amygdala who should grab you and take you to the dlc. Can I get to the dlc somehow? This is a very dumb question but can you get the eye if there is blood moon? Can you play with people who don&apos;t have the dlc? As in they have the base game and you have the dlc. Is the DLC affected to ng+? I just beat the game. Just beginning NG+. If I go and reach the point to find the old hunters. Will the DLC be more challenging since I&apos;m on NG+ on the original bloodborne game? How does one get around the problem of the disc and dlc having different regions? I dont want to have start from scratch rebuying the game and making a new character. This DLC is already irritating me. Not because of the difficulty, but because I can&apos;t seem to find the item I need to get in the Hunter&apos;s Dream in order to even access the DLC in the first place. I killed Vicar Amelia and I interacted with the skull right after doing so. I go back to the Hunter&apos;s Dream and the item isn&apos;t anywhere to be found. I&apos;ve read it supposed to be right next to the doll, but it&apos;s not there. I&apos;ve tried looking around the dream itself and again, it&apos;s nowhere to be found. Is there something I&apos;m missing or is the game just being stupid and deciding to keep the item from me for no apparent reason? I seriously would appreciate the assistance. Hey guys, I was wondering. Can you re-do the DLC just like you can re do the game? Like, I NG+ for the DLC? I have played the GOTY edition, but I don&apos;t have it anymore. If I get the normal one that does not have DLC included - will I be able to use my old save data?